As the flowers were blooming with the long, harsh winters slumber over, Maharishi University of Management in Fairfield, IA played host to some of the juggernauts of sustainability with Lonnie Gamble teaching a High Performance Green Building class, Dr. Elaine Ingham delivering a masterful Living Soils class, and Scott Pittman of Permaculture.org and Doug Crouch of TreeYo Permaculture facilitating a Permaculture Design Course. 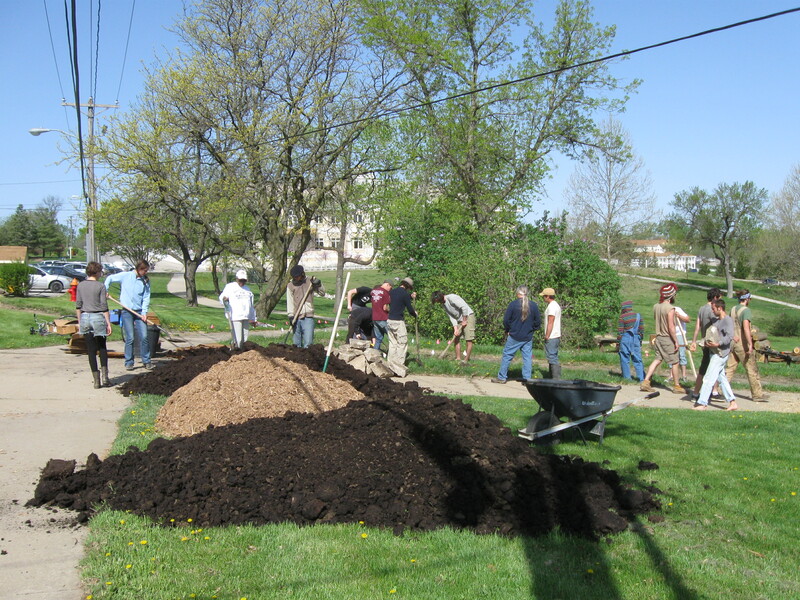 This infusion of energy had the local community and student body a buzz with the plethora of possibilities that were emerging- compost tea, edible landscaping, and roundwood construction to name a few. 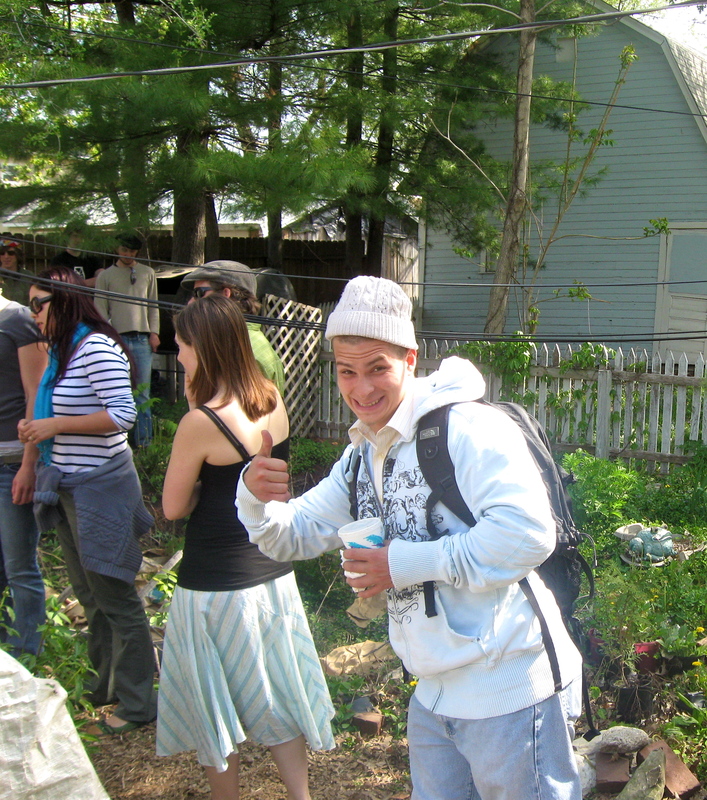 The 72 Hour Permaculture Design Course is the first required course in the Sustainable Living Department meaning that all students get this framework from the get go. With a new crop of students that started during the winter semester, plus others who hadn’t taken it before this pre-requisite was enacted, composed the 21 students that were certified through the University. It was a great course as a few of the incoming students said, “This was the course I came here for”!!! This course was altered a bit from the Fall 2009 course as we follow the design process that builds in re-evaluation and then a better design implemented. We took off a couple of assignments and upped the number of weekly quizzes based on previous feedback that the students wanted homework that focused them on the reading from the textbook that we use: Introduction to Permaculture by Bill Mollison. This made the academic side of the course focused and rigorous yet not too exhausting and diverting. One of the assignments that was a common thread was an assignment called Instructables. This entails building a piece of appropriate technology such as a worm bin for the urban setting and then doing a detailed description with pictures on the Instructable site. It’s a great website for the DIY people out there to get pictures and tips on small projects. 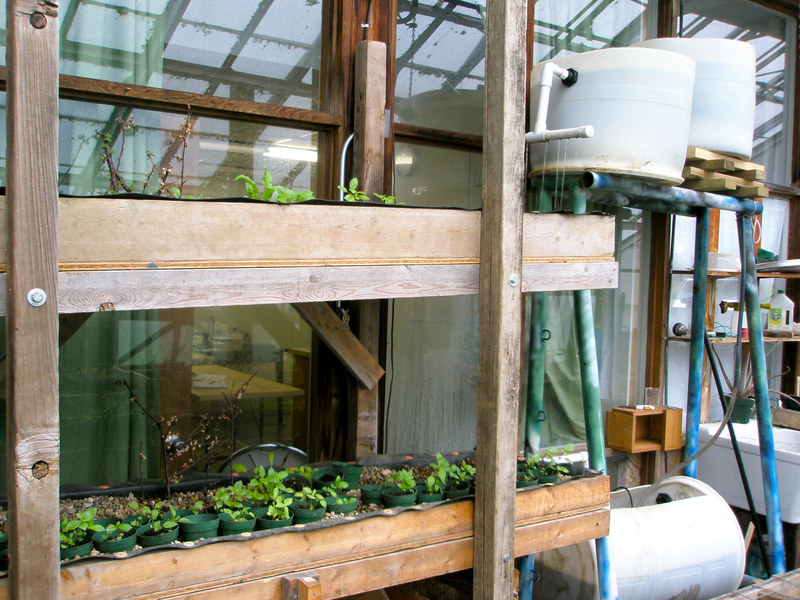 A group of students took on rebuilding and upgrading the aquaponics system in the school greenhouse, which is attached to the Sustainable Living Department building. They welded a stand to make better use of gravity after the small pump takes the water from the fish tank and up to biological filter tanks equipped with aquatic plants. After this it is gravity fed down through gravel beds which houses starts and potted plants such as taro and bamboo. This system is connected to the rainwater harvesting barrels that some other students retro-fitted to bring a purer water source into the greenhouse from the school roof for irrigation. 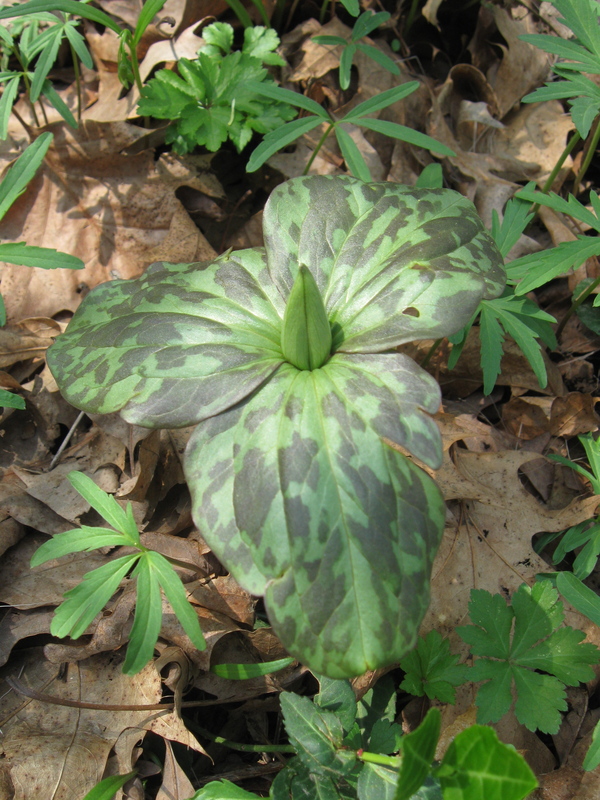 Another student assignment is to do what is called the Plant/ Species assignment. I believe it was originally a Bullock Brothers document but we have slightly altered it to simplify and clarify on a couple of sections. This assignment allows students to explore a species in great detail including drawings. 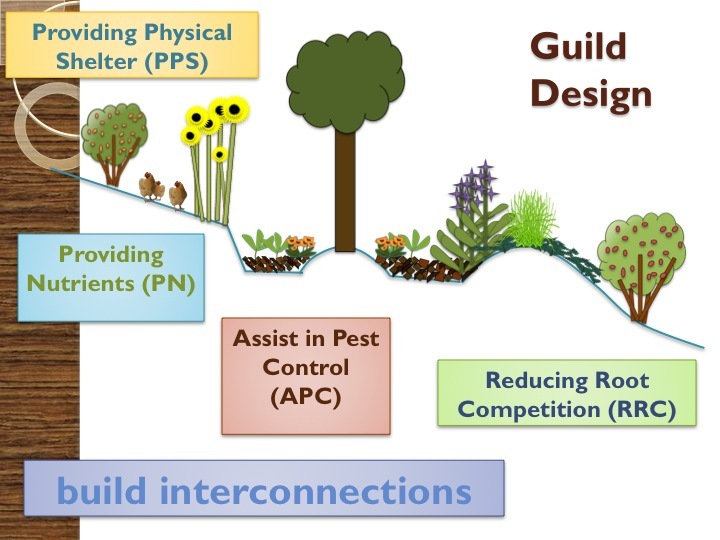 Then they place this plant in a guild and build a grouping of beneficial plants in accordance to appropriate climate and soil selection. 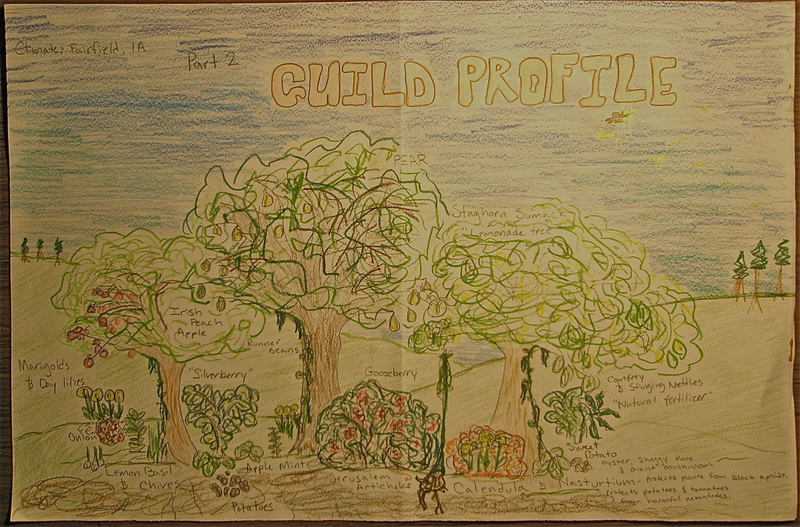 They detail the interactions of the guild and the associated drawings bring it to life and encapsulate an introduction to design One student went really wild with this assignment and created a full-on food forest in his drawing which was quite above and beyond the assignment. In addition to the theory side of the course delivered by Scott and Doug, we were able get some hands on accomplished on campus this time. Drawing from a past students design project from Doug’s fall course at the Uni, he worked hand in with Ashley O Smith to get an edible forest garden plot implemented in an awkward part of campus. It was a strange diamond shaped space with two sidewalks directly next two each other creating a slender triangle within the diamond. This is an artifact of Parsons College which preceded Maharishi. So we had the sidewalk removed and then we used this urbanite quite extensively for making paths that ran on the downhill side of our mini-swales. 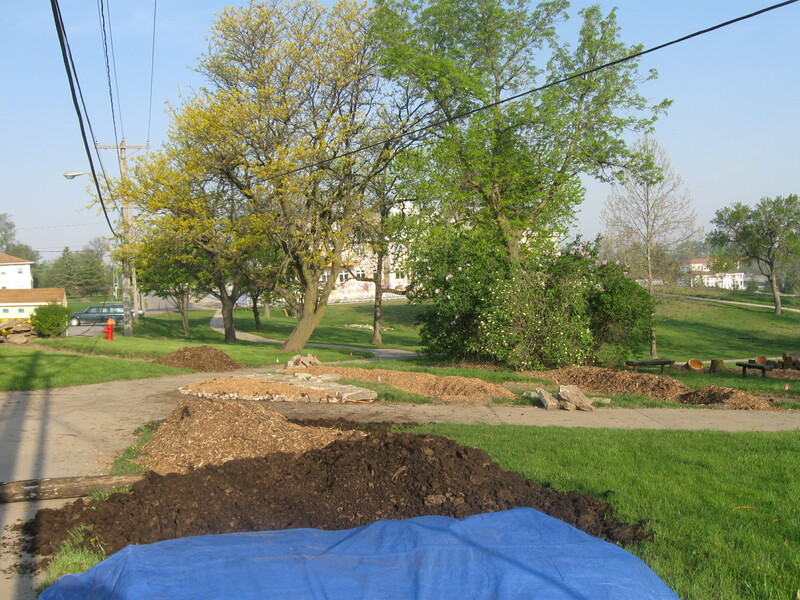 So we laid contours, dug, mulched, laid pathways, sheet mulched for the landscaping, and mulched heavily for the outdoor common spaces that will have benches, tables, and soon a large sized chessboard made from our recycled concrete. We got in our Serviceberry and Hazel hedge to help give a bit of a privacy hedge to the space and a windbreak from the constant plains wind. We fully guilded this hederow out with plants we collected on our field trip that included garlic chives, Egyptian walking onion, anise hyssop, edible violet, and several varieties of comfrey to begin with. 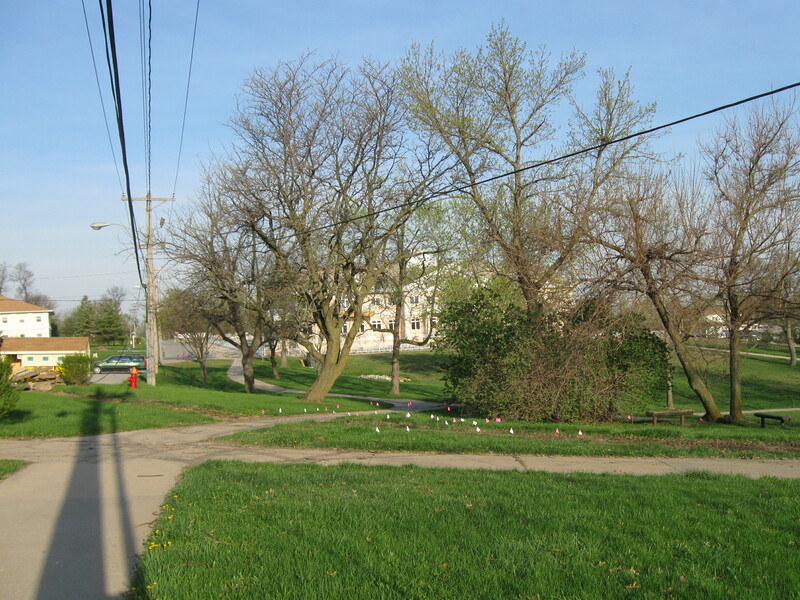 To come still is raspberry plots, paw paws, and asian pears with more understory development. This space is a great addition to the somewhat traditional, sterile landscape that most universities have. Now it solves the lack of outdoor “chilling” space for students while also providing color, vibrance, and a harvest of fruit on the way to class. During the course we managed to slip away for some field trips that took us to Brian and Kelly’s Urban Jungle just minutes from campus. Kelly toured us of her incredibly diverse, small scale intensive plot that showcases Permaculture to the local Fairfield community in this very visible urban lot. Here the students got to learn plant propagation in the form of cuttings, early seedling techniques, root division, and layering. We reviewed the Permaculture Principles there and had a fun list making review session with all the different fruits we saw. 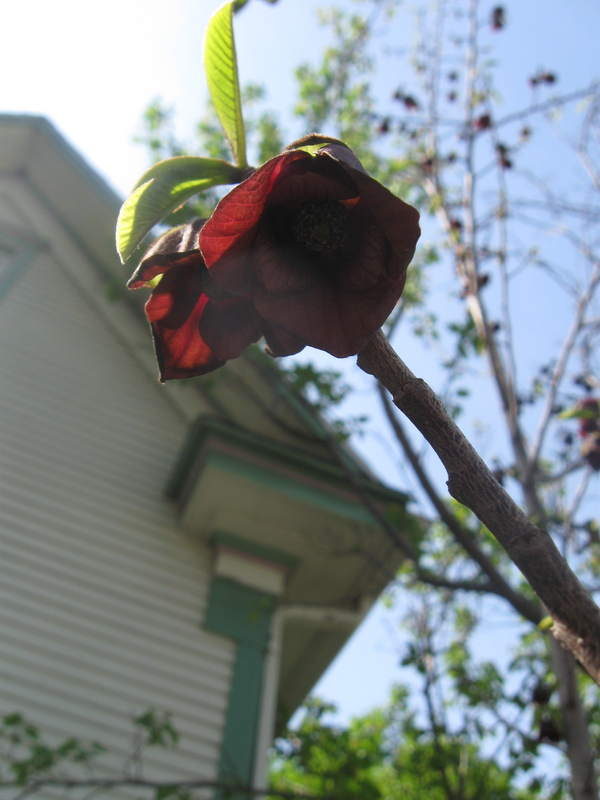 One that was flowering while we were there was the American Paw Paw (Asimina triloba). These trees absolutely pump in Kelly’s back yard and reminded me of the Paw Paw, mesquite smoothie that was served to me there last fall. All the while, I was able to continue to learn from Dr. Ingham building upon the knowledge accrued at a 3 day course with her at the Carbon Farming Course that was held at the Farm in Tenessee last August. We continued our work on a soil succession card game that myself and my teaching partner, Gauteir Gras, have been working on. It’s still a work in the progress but a lot of headway was made and before long we will have a highly effective teaching tool for expressing the diversity and complexity that builds after disturbance. 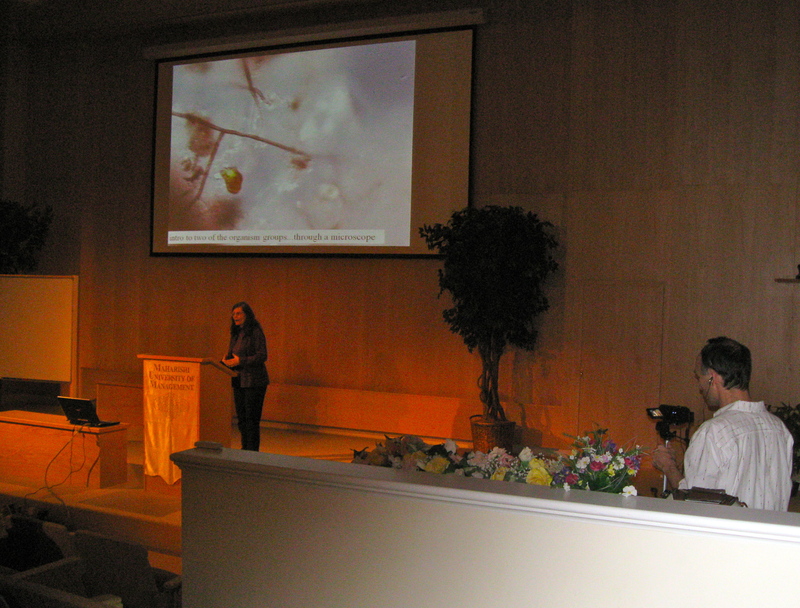 Dr. Ingham also did a couple of compost tea workhops that I got to be the gopher for, which aided my confidence in this process. I learned firsthand this is all contingent upon good compost- made aerobically, digested fully, monitored with temperature, turned accordingly, and most importantly checked with a microscope. These highly active compost creatures can then be further breed in an aerobic compost tea, to quickly accelerate succession and evolution in the soil. As an organic farmer, making aerobic compost is one of the most vital farm tasks and Dr. Inghams’ work to exploring the relatively unkown galaxy of soil life is one of the greatest contributions to organic agriculture in a long time. 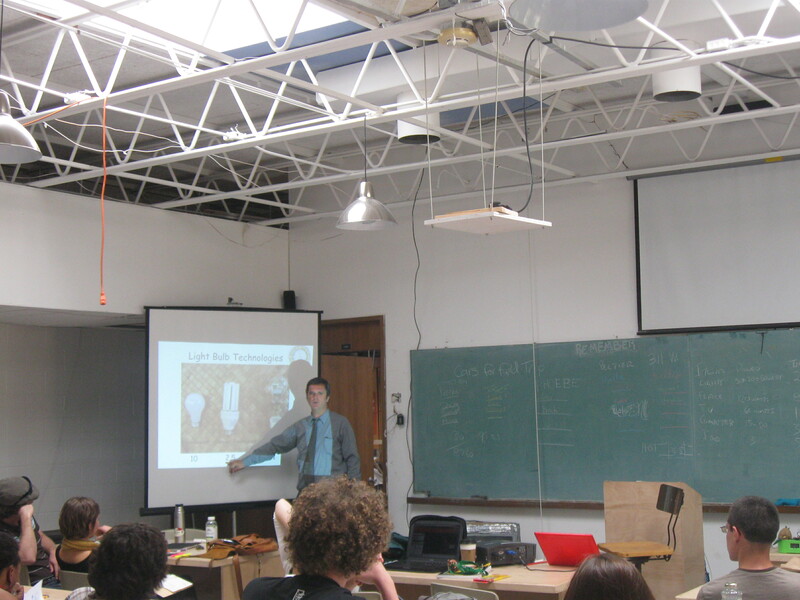 Whether it’s hosting a green building workshop like Incorporating Roundwood Timbers into Buildings or having organic food in the school cafeteraia, the idea behind this all at the University is consciousness. At Maharishi University of Management, out in the middle, the heart, the very epi-center of GMO chemical agriculture, they are blending sustainability and meditation. Transcedental Meditation has been the main aim of consiouness development on the campus until recently. 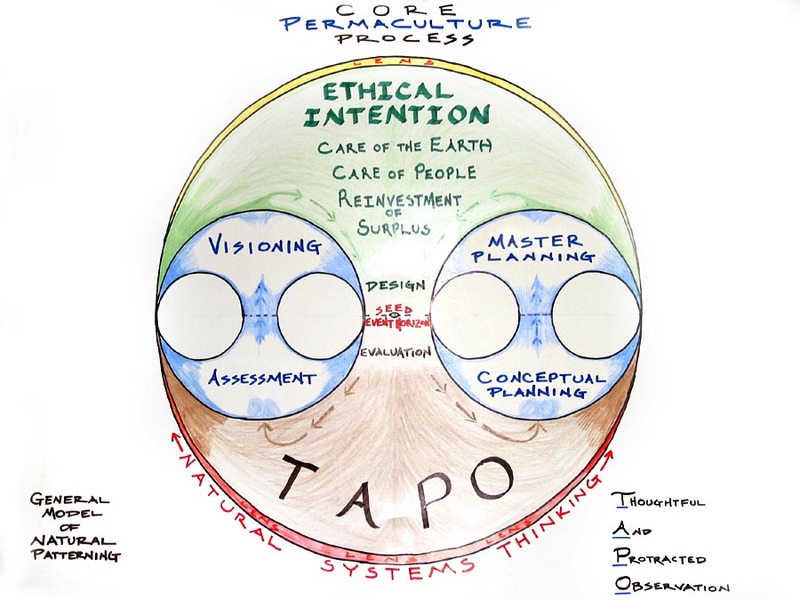 However it now includes sustainable living and the regenerative practices that are involved in Permaculture Design. 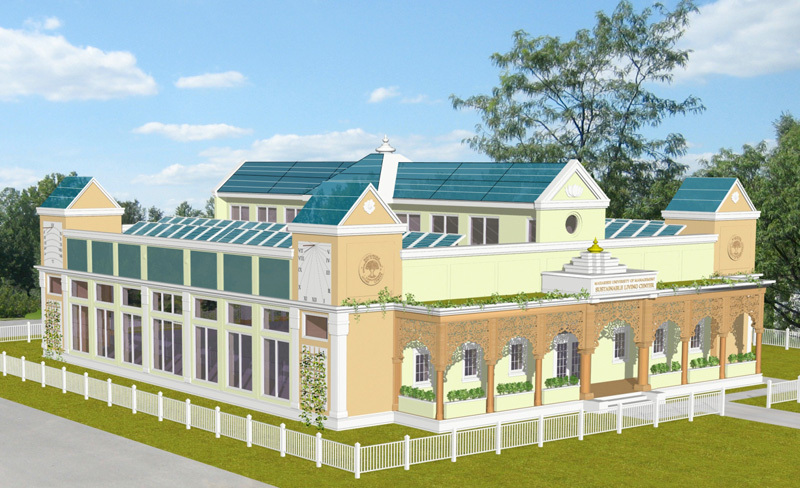 The program is growing and the new building is sure to fuel more growth in showing the power of design and conciousness.